── On the 21st February, there will be a retirement match for Takashi Iizuka. Mr. Okada, you’ll be taking part in this match but the fans were a little confused about your inclusion in the match . 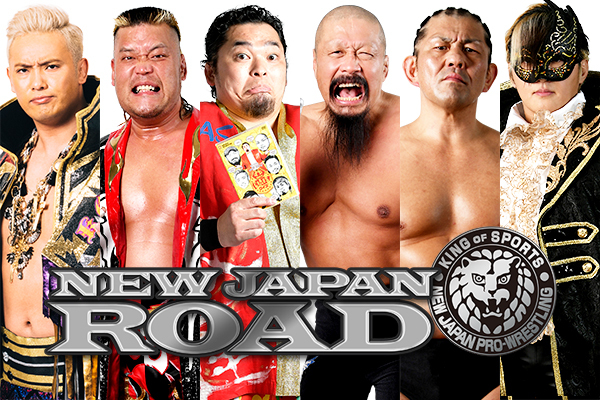 ── In that match, we can see that Tenzan is included since he’s trying to re-kindle the “Friendship Tag” group. Yano was also Iizuka’s partner for a long time, but your name seems like an anomaly. Why do you think your name was put forward? Okada: Perhaps it’s my name value? Aren’t there quite a few wrestlers doing these retirement matches recently? I participated in [Genichiro] Tenryu’s retirement match as well [November 15th 2015]. As a wrestler, I can appreciate the appeal of having a final match. Is it really his last one? Okada: At first I was surprised, but in the end I’m thankful that I can finally feel the power of Takashi Iizuka in his last time in the ring. ── Although, you might have felt that your inclusion on the card was a little bit of a surprise, it seems like you’re really up for it! Okada: Yes! It’s not like there’s no relation between me and Iizuka either. When I first joined the NJPW dojo, he was one of the strictest coaches there. Okada: Yeah, the “Before he became like that” Takashi Iizuka. From the moment I entered the dojo until I debuted, he was the type of wrestler who never stopped training. However, it was in my debut series that he changed into the “current” Takashi Iizuka. ── Oh, was that the same time? Okada: Yes, I debuted in New Japan in April 2008. ── Oh, yes, in the Hasuda city general citizen gymnasium on 12th April, 2008 against [then] Taichi Ishikari [Currently Taichi]. ── About two weeks after your debut, was that unforgettable night in the Osaka Prefectural Gymnasium Convention – 27th April, 2008. Okada: Yes. In that match, I was acting as a second. Those days I was wrestling with all my heart. I may have been only a Young Lion, but I was fighting alongside Tenzan. ── Although it’s very rare for you to team with Tenzan recently, in 2008 you were partnering quite frequently. Okada: That’s right. It’s been a long time since those days but I fought alongside Tenzan and Iizuka both in New Japan and when we went to Noah. ── It seems like you actually have a long history with Tenzan and Iizuka. Okada: That being said, I was watching Iizuka transform and become “like that” before my eyes with an open mouth. Whether it was his time as a demon coach, a monster, or when he came to join us in CHAOS. ── After making your triumphant return as the Rain Maker (2012), he became your teammate in CHAOS. Was it surprising that the man who used to be your coach had made such a rapid transformation? Okada: That’s right. I never thought that he would become such a madman. ── I can’t think of any other situation in Japanese wrestling history that a skilled, orthodox wrestler like that transformed so extremely. Okada: At the time I was so surprised! I thought “New Japan Pro-Wrestling is like this? !” That was because Iizuka ripped apart my image of him as “Mr. New Japan Pro-Wrestling”. ── I know, right. However, I think that New Japan at that time at a point when it was struggling. We were really fighting to find ways to bring in people to come to our events, but I think in a way that event might have helped us make a breakthrough. Okada: I suppose so. But I wonder whether he did something similar during his time with CHAOS. ── I feel he may have been doing it frequently. Especially in the early days of CHAOS. Okada: I do not remember much back-stage organizing, but I got the impression that he would be a really tough guy to fight. We don’t normally have to fight each other in CHAOS, except in special circumstances such as in the G1 Climax, which is a singles match. ── Since he’s been “like that”, Iizuka has not entered the “G1 CLIMAX” tournament since 2009, so you never got the chance to fight him during his time in CHAOS. ── I see. Originally, Iizuka was a solid, orthodox fighter, but what has been your experience of fighting him since he became “like that”? ── It felt like he was completely resetting the style and technique he has built up to that point. Okada: Now, his signature move is the Iron Finger [From Hell]. He’s like ther monster of all monsters, “The heel of the Showa era” is the impression I get. He’s not a cool and flashy type of bad-guy, but every time he comes in the venue, he terrorizes the crowd. The fact that he’s still able to do things like that in this day and age, to me, is very representative of Iizuka. ── Even globally, there are not many wrestlers who are as so thoroughly far-gone as him. Okada: Not really. Even when he was in CHAOS, he never came to any of our dinner parties. ── So, he had no private relationships at all with his teammates? ── In this day and age of SNS, it’s rare to have such a person who is so silent both outside the ring and privately, you never hear much from him. Okada: That’s why Iizuka was such an enigma. He was a mystery when we were in CHAOS together. Although, I would say that for two years, our relationship was not zero. Being in the same team certainly helps. ── I think that the atmosphere of the faction became much brighter since both you and YOSHI-HASHI joined CHAOS. 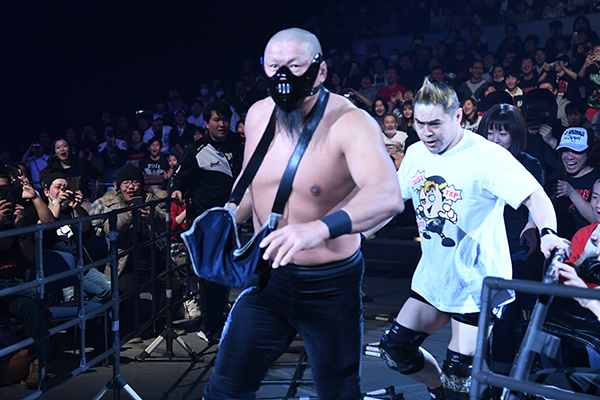 Perhaps Iizuka felt uncomfortable with the new, more upbeat CHAOS and left to join Suzuki-gun. Okada: Oh, maybe that’s what it was… Anyway, I think the balance of the three of us on our side is very good. There’s Yano, who’s known Iizuka since their days together in GBH and Tenzan from their days in the ‘friendship tag.’ Finally, although my connection with him is not as strong, his former CHAOS teammate in myself. ── Since you are joining the match, some of our newer fans who may not be familiar with the days of the ‘friendship tag’ can still enjoy the match. Okada: Yes. There are many fans out there who want to be surprised in matches. I think they could also get that same sense of surprise by getting to know about the old Iizuka. By understanding the relationship between me, Tenzan, Yano and Iizuka you’ll be able to get a greater sense of enjoyment when watching this match. That being said, just like against Tenryu, I’m going all out. Heheheh. ── For a retirement match, we have to bring out flowers etc. On the other team, you have Suzuki and Taichi, do you think you’ll try to get involved with them as well. ── In terms of getting a last meal, a wrestler like Kazuchika Okada would make a fine banquet no? Okada: I want to go after Iizuka with everything I have. That way, it will go down as a big moment in Iizuka’s history with the company. “He retired after eating a Rainmaker”. Yano and Tenzan feel the same way as me. Of course, Iizuka will still try to go after me with an Iron Finger or sleeper hold, but my aim is to make an impact. ── It’s unprecedented for a retirement match to end in a disqualification. There is also the question as to whether or not Iizuka will regain control of his senses. Okada: Ah, I don’t know much about that, but Tenzan really seems to be holding out hope. Okada: Oh, what would happen then? Is he going to turn around and make it a 4 vs. 2 or something? ── I wonder. What do you think will happen in the end? Okada: I don’t know… However, looking at the question more simply, I think that people will cry at the end of his retirement match because Iizuka is so fondly remembered as an overwhelming heel. ── That may well come to be, in any case it’s a rarity to have a farewell match for this sort of wrestler. Okada: I don’t really understand. However, my opponents will be Suzuki-gun. Even if I get the three counts over Iizuka, I’m sure they have something up their sleeves. It’s a big moment so it really could be anything at all. His partners are Suzuki and Taichi, so I’m definitely going to go after Iizuka. This match is going to be a really tough battle. ── I see. I think this time and this time only, the crowd are going to be cheering Iizuka heavily. Okada: No… We won’t know for sure until the match actually starts, but I actually think that Iizuka-san is going to be booed until his final bell. ── Well, he’d be going out the way he lived. Okada: I think that Iizuka will be a monster until the end. Even if it’s going to be his last match, he’s still a demon. If I don’t go there with an intent to win, I’ll be doing Iizuka a disservice. I’ll beat him cleanly, with a Rainmaker, and say goodbye.